What would one day become a sprawling theme park chain with park’s in three different states, began as a much humbler, and quite different idea. SeaWorld was created by four UCLA college students who originally had a different idea. Their original goal was to build an underwater restaurant where diners could watch a marine show while they ate. After this idea was scrapped, they decided upon opening a theme park. The first park opened on March 21, 1964. This park, SeaWorld San Diego, is still a thriving park today. Although the line-up of entertainment was small, with only six rides & attractions, along with dolphins and sea lions spread across twenty-two acres, the park was a roaring success. By the close of the first year, over 400,000 guests had passed through the gates. Due to the unexpected and phenomenal success of SeaWorld San Diego, the founders decided to build a second park in the chain. After searching the mid-west of America, a location was finalized on in Aurora, Ohio. The location was convenient as it was only thirty miles from Cleveland, one of the busiest cities in Ohio. This second installation of the SeaWorld parks opened in 1970. Unfortunately, the climate was not as temperate as San Diego, so the park had a fairly short season. Despite this, the park still succeeded, until 2004, when after many changes in ownership, the park was redeveloped into a new water park. Just around the time this park arose, a new entertainment resort complex was being built in the swampland of central Florida. Walt Disney World opened in 1971, and the once-swampland of central Florida became a top spot tourist destination. The executives of SeaWorld knew this would be a great new place to open the third park in the growing chain. On December 15, 1973, SeaWorld Florida celebrated it’s grand opening. The park sprawled across 200 acres of land, and featured a year-round operating season, just like it’s San Diego sister park. The park was successful, just like it’s counterpart in San Diego. For twenty-seven years the park kept growing at a steady pace. During these nearly three decades, many changes in ownership occurred. At one point, the park, along with it’s sisters, including the newly built SeaWorld San Antonio which opened in 1988, was owned by a schoolbook publishing company. In 1990, this company sold the park’s to what would arguably be their most productive and profitable owners yet. These new owners were none other than a subsidiary of Anheuser-Busch, America’s largest brewery. Busch Entertainment Corporation, also known as BEC, immediately set to work on the parks. SeaWorld Orlando currently operates with three thrilling attractions, the 400 foot Sky Tower, a plethora of rides for children and their families, seven shows, ten animal exhibits, and numerous shops, many that you will only find at SeaWorld. In 1998, one of these three thrilling attractions was added. Journey to Atlantisopened to rave reviews. The exterior of the ride alone amazes all who pass by it. The ride is a water coaster developed by Mack, a German roller coaster manufacturer. As the name implies, the ride will take you on a breathtaking ride through the underwater city of Atlantis. As the ride reaches it’s climax the boat vehicles plunge sixty feet down one of the steepest drops on a water ride in Florida. This creates a massive splash sure to wet everyone around. As amazing an attraction Journey to Atlantis is, many thrill-seekers were still leaving the park feeling a little empty inside. In 2000 this all changed. 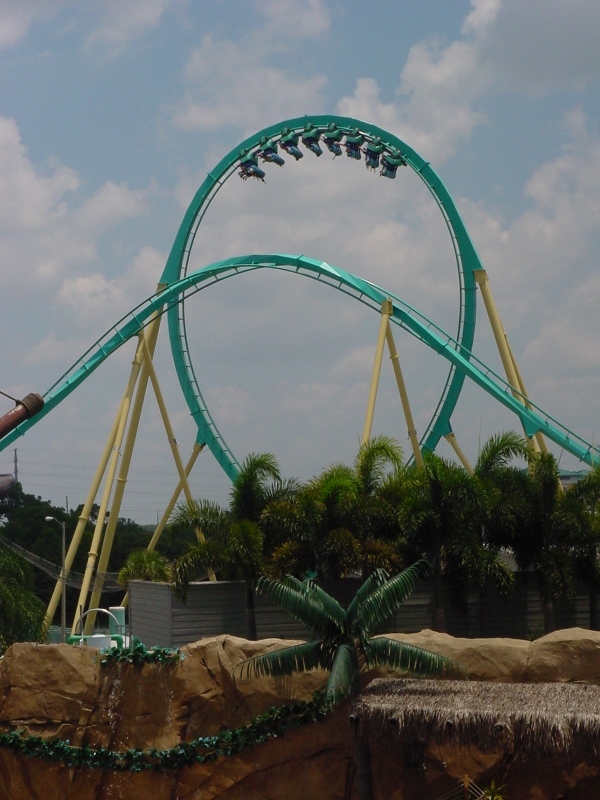 During the millennium year, SeaWorld Orlando debuted Kraken, a roller coaster of legendary size and power. Kraken is a floorless roller coaster, which means there is no floor below you, just the track speeding by. It was developed by renowned coaster designers Bolliger & Mabillard. During the two minute ride, guests are flipped upside-down an incredible seven times, reaching speeds of sixty-five miles per hour. At Kraken’s highest point, riders are 149 feet in the air. On top of all of these pulse-pounding elements the thrilling roller coaster dives underground three times. Besides these incredible scream machines, there are seven shows throughout the park. Believe is the newest show at the park which features legendary whale Shamu. The addition of this attraction led to the park’s new slogan as of 2006: Do You Believe? Another popular show at SeaWorld Orlando is Pets Ahoy! This show is unique at SeaWorld in that is does not feature water dwelling animals, but household pets. Well, mostly that is. It not only features the typical dogs and cats, but skunks, rats, birds, pot-bellied pigs and other animals. Together it is a cast of 100 animals that put on the show multiple times a day. Nearly all of these animals have been adopted from either an animal shelter or pound before they became actors at SeaWorld. Odyssea is another unique show found only at SeaWorld. Here, acrobatics meets the ocean in a sensational show of acrobatic and comedic talent. During the summer and holiday season, Mistify lights up the sky every night. Sixty foot tall screens made of mist house images of enormous and breathtaking animals. Massive, 100 foot fountains and fireworks add to the effects. On top of this an amazing fire on water effect is seen. All of this is seen at an incredibly small distance of anywhere between fifty and 100 feet away from the action. SeaWorld is unique not only in the multitude of rides, attractions and shows it offers, but the park even manages to make it’s shops and restaurants unique. The Oyster’s Secret offers a shopping experience like no other. It could be considered window shopping; that is, if you think window shopping is picking out a pearl in an oyster at the bottom of an enormous glass tank. When you see the one you want, a professional diver will dive to the bottom of a tank and retrieve the perfect oyster with the perfect pearl just for you. At SeaWorld Orlando, you will not find the typical vendors selling hot dogs for lunch. Instead you will find a one of a kind dining experience at different restaurants across the park. In one of these restaurants as guests dine, a massive glass tank makes up one whole side of the restaurant. All kinds of sea dwelling creatures swim around and provide a beautiful backdrop to the perfect meal. For those with younger children who maybe aren’t quite ready to face the fears of a roller coaster like Kraken, have no fear. SeaWorld Orlando has something in store for guests of all ages. The biggest children’s ride is The Shamu Express. This new family coaster opened in May 2006 as part of Shamu’s Happy Harbor. It’s the perfect way to ignite a child’s coaster interest, and one day they just might brave Kraken. Two other spinning rides are a part of this area in the park that made their debut in 2006. Those rides are Jazzy Jellies and Swishy Fishies. During the summer of 2005, executives from SeaWorld Orlando made an astounding announcement to the theme park industry. Originally set to open in the spring of 2007, but pushed back to 2008, SeaWorld will open a revolutionary new water park adjacent to SeaWorld Orlando. This will be the third park at the SeaWorld Florida complex, adding to the current roster of SeaWorld Orlando and Discovery Cove. According to the executives at SeaWorld, there will be revolutionary water slides and rides at this new park. One slide was described that would take guests through transparent, enclosed water slides. The catch here is that it would go through a tank where dolphins and other creatures would be swimming around the visitor. So what does the future hold for SeaWorld Orlando? Obviously a new neighbor, that will be a unique, one of a kind water park. Will any more thrilling attractions come, that will conquer Kraken as a more intense roller coaster? Could there be new shows that top that of the likeable Pets Ahoy! or the amazing Mistify? With all this in mind, there is only one question which remains: Do you believe?